This protein rich, quick prep salad is perfect for a busy weeknight dinner or portioned for grab and go lunches. 1In a large bowl, combine rinsed and drained beans, onion, peppers, a few diced olives, feta and salad dressing. 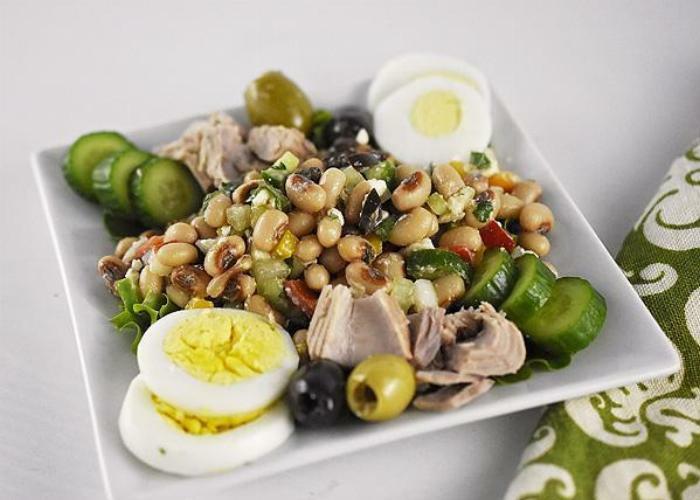 2To assemble, divide greens onto four plates, top with portioned bean salad, tuna, half egg per plate, cucumber and olives. To prep for lunch, separate lettuce from bean salad. Store in refrigerator for up to four days.